Are You Related to Royalty? It's so often the subject of family lore - a connection somewhere in the family to royalty or nobility, perhaps scurrilous rumours of an illegitimate child born out of wedlock in a courtly scandal, or a Lord stripped of his title and land following a failed coup d'etat. If only you could prove the connection beyond doubt, those castles would be yours, right? Britain's Real Monarch, which posited that the rightful King of England was actually a farmer in Australia. Or the recent discovery by Welsh comedian Greg Davies that he was descended from Owain Glyndŵr, the last native Prince of Wales. These cases show that there may be connections to royals or nobles in your family tree just waiting to be discovered. So, What Are the Chances? 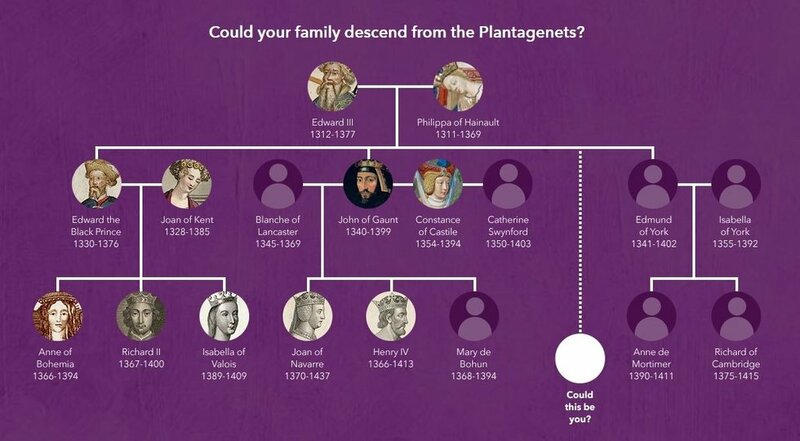 With at least 40 bastards born within the royal family between the eleventh and fifteenth centuries, Who Do You Think You Are Magazine has suggested that there are over four million descendants of Edward III alive today, with that article going on to state that some experts believe that "practically everyone" with British ancestry could be descended from royalty. If you're one of the estimated 13% of Americans with British ancestry, your chances of finding a royal connection are actually better than you might think. Now that we've established the possibility of a royal or noble ancestor, how do we go about establishing this connection? Here's a few resources to explore to determine whether you should be marching to the palace and demanding your set of keys. Or, failing that, if your ancestors simply had friends in high places. By far the easiest way to establish a royal connection is by taking a look at the people living at a certain address. And we're not just talking Windsor Castle, think of royal country homes, castles or other addresses associated with the family you're tracing. A quick search can tell you the place of residence of royalty and nobility through the years. 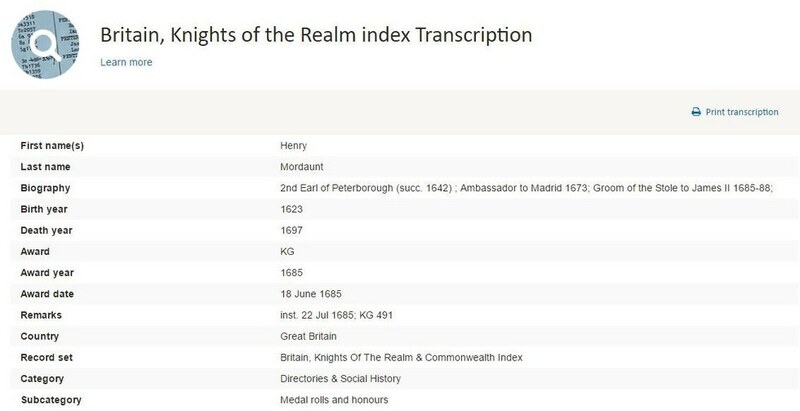 Once you've identified the address of the palace, castle or stately home you're interested in, simply search by address in the census and see if you recognise a familiar name in the list of inhabitants. Don't forget, house names, streets and county borders can change over the years. Check maps from the relevant period to ensure that you're searching for the right name, and always keep your search terms broad, remembering to use wildcards where appropriate. Findmypast is home to this collection of 386,000 records of individuals who worked for the royal household during a period that spans almost 400 years. If there are rumors of your ancestors having trod the royal boards, there's every possibility they may have worked as a member of staff. This incredible collection includes at least one image from each record held at the Royal Archives. Often, these images will contain further information, including your ancestor's signature and, if relevant, the reason their employment came to an end. Reigning monarchs would typically employ in excess of 1,000 people, providing plenty of opportunities for you to discover an ancestor or relative who served the court in some way. In these records you'll find everything from "Chocolate Maker to the Queen" to "Keeper of the Lions in the Tower" to the unfortunately intimate yet highly esteemed role of " Groom of the Stole". So, maybe your family didn't live at the royal home, and maybe they weren't employed by the household. But the search isn't over yet. Many people with a strong connection to royals would have been awarded with an order of chivalry. This collection contains the records of 35,000 people, from the 13th century to the present day. In these records you'll find kings' most trusted confidantes, knights rewarded for their valour in battle and also more modern figures, like the actor Laurence Olivier and former UK Prime Minister Margaret Thatcher, a Baron and Baroness respectively. Noble and aristocratic families are likely to be recorded in the vast scope of directories and social histories available on Findmypast. This collection of almost 18 million records from across the world contains everything from highly detailed histories of certain names and areas to more general directories of who lived where, when. While less comprehensive than census records, these records often contain much more detailed information on the people contained in them, including a fantastic collection of Family Histories & Directories that trace the lineages of influential society members.